The conduct of relations of one state with another, commonly known as diplomacy, has been used throughout history in various forms. While the essence of diplomacy stayed the same, different customs or practices developed in separate regions of the world. A Japanese diplomat in the Edo period would not use the same style of diplomacy as a Spanish diplomat in a state visit to the Netherlands at the end of the twentieth century. Our modern diplomatic system can be traced back to Italy in the end of the fifteenth century. From Italy, it spread to the rest of Europe in the beginning of the sixteenth century. Among the European states that modernized their diplomatic institutions was France, led by king Francis I (1515-1547). Francis I, nicknamed ‘the Most Christian King’, used his recently modernized diplomatic system to cooperate militarily and economically with the Ottoman Muslim sultan, Suleiman ‘the Magnificent’ between 1536 and 1544. This research focused on how the diplomatic networks of both states managed to cooperate despite their differences in religion, identity and the use of diplomacy. France was initially not a forerunner in the modernization of the European diplomatic system. At the beginning of the sixteenth century they still used the same medieval style of diplomacy while other states, such as Spain or the Italian states, already finished modernizing their diplomatic system. But Francis knew that this would become an even bigger problem if it was not tackled as soon as possible. He wanted to create a professional and modern group of diplomats who could represent French on the international scene. He started educating new diplomats and ambassadors and around 1529 the modernization of the French diplomatic system was completed. The first group of diplomats and ambassadors that was educated in this new system proved to be very important for the cooperation with the Ottomans. The French managed to conclude a treaty with the Ottomans in 1536 and they worked together in a naval operation between 1543 and 1544. In the early-sixteenth century, after its conquest of Constantinople in 1453, the Ottoman Empire was a direct threat to the Christian states in Europe. The Ottomans conquered more and more parts of the Balkans and they also began capturing islands in the Mediterranean. The European states were terrified of this ‘Infidel’ who seemed to be sent by the Devil himself. Some popes wanted to start a new crusade against the Ottoman Empire, but these initiatives failed because the Christian powers were too divided among themselves. They competed against each other while the Ottomans gladly profited from this situation. The historical research concerning these events has often focused too much on Habsburg sources. The French and Ottoman sources were often neglected or they paid too little attention to them. Ottomans were often sketched as barbaric troops that raped and pillaged every town they encountered. This has begun to change since the last century. More and more research has started to focus on the Ottoman and French sources. This has also led to a change in the view of the Ottomans and French in that period. The Ottomans were not as barbaric as previously thought, with some authors claiming that the Ottomans were more disciplined and orderly than any European army. How is it possible that these two totally different states have cooperated in an age with limited communication technologies? How did they not only conclude a treaty, but also cooperate in a naval operation? In the research I have looked at how the diplomatic networks of the French and the Ottomans worked together. Who were the most important persons in these networks? 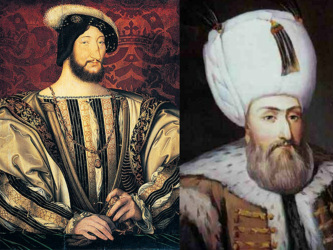 The French diplomats that worked hard to conclude the treaty in 1536 with the Ottomans were Giovanni de Frangipani, Antonio Rincon and Jean de la Forest. Frangipani established the first link with the Ottomans in 1526, Rincon managed to maintain a good relationship wth Suleiman throughout the 1530's and de la Forest, as resident ambassador, negotiated and eventually signed the 1536 treaty with Grand Vizier Ibrahim Pasha. The French diplomats that were involved with the 1543-1544 naval operations were Antoine des Escalins, Marillac and , again Rincon. Rincon (1536-1541) and des Escalins (1541-1544) both became French resident ambassdor to Constantinople and Marillac was a temporary replacement after de la Forest's death in 1537. In the French network each had their own role, some more important than others, but they all contributed to the eventual result. This network of diplomats allowed the French king to cooperate with the sultan of an empire which greatly differed from his own kingdom. These diplomats were the persons that tied the French king and the Ottomans together. Their great efforts and sacrifices enabled the French king to communicate, negotiate, and eventually, cooperate with the Ottoman Empire. Most important in the Ottoman diplomatic network were the Grand Viziers. Ibrahim Pasha, Ayas Pasha, Lutfi Pasha and Suleiman Hadim Pasha. These Grand Viziers could decide who could have an audience with the sultan and who couldn’t. The most important Grand Vizier in this period was Ibrahim Pasha who, at the end of his life, dominated almost the entire foreign relations of the Ottoman Empire. The others were less powerful, but still very important. The non-national servants Yunus Beg and Ludovicio Gritti also played essential roles as interpreters and envoys. These servants opened up new ways of communication between the two parties and allowed them to cooperate not only through the Grand Viziers. Even though the diplomatic network of the Ottomans worked totally different than the French one, this network of servants of Suleiman allowed the sultan to communicate and cooperate with the French king. Both the Ottoman and French diplomatic networks proved to be very important in the materialization of the treaty of 1536 and the 1543-1544 naval operations. Despite the differences in religion, identity and the use of diplomacy, the actors within these networks succeeded in cooperating with each other. Some actors were more important than others, but they all did their best to overcome the barriers that existed. De Lamar, Jensen. " The Ottoman Turks in Sixteenth Century French Diplomacy." The Sixteenth Century Journal : A Journal for Renaissance and Reformation Students and Scholars 16, no. 4 (1985): 451 - 470. Isom-Verhaaren, Christine. Allies with the Infidel. Library of Ottoman Studies. Vol. 30. London: I.B. Tauris & Co. Ltd, 2011. Knecht, R. J. Francis I. Cambridge: Cambridge University Press, 1982. Mattingly, Garrett. Renaissance Diplomacy. Penguin University Books. New ed. Harmondsworth: Penguin, 1973. Merriman, Roger Bigelow and Archibald Cary Coolidge. Suleiman the Magnificent, 1520-1566. New York: Cooper Square Publishers, 1966; 1944. Vaughan, Dorothy M. Europe and the Turk: A Pattern of Alliances, 1350-1700. Liverpool: Liverpool University Press, 1954. Yurdusev, A. Nuri. Ottoman Diplomacy: Conventional Or Unconventional?. Studies in Diplomacy. Basingstoke etc. : Palgrave Macmillan, 2004.